What happens when you put some of the greatest minds in the Jailbreaking community together for one whole day? 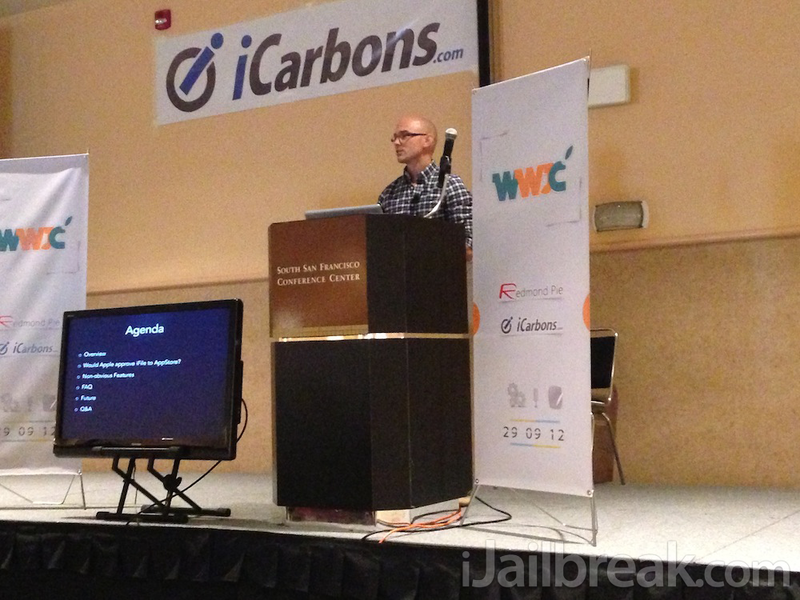 Well, you get the World Wide Jailbreaking Convention, or JailbreakCon for short. 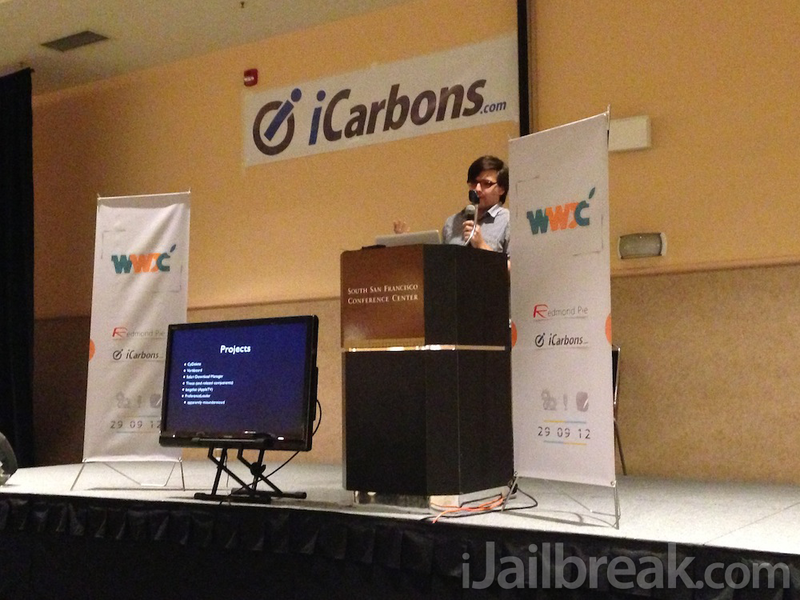 A convention solely dedicated to the Jailbreaking Community, where everyone comes together for various workshops, presentations and of course just to mingle and have fun. 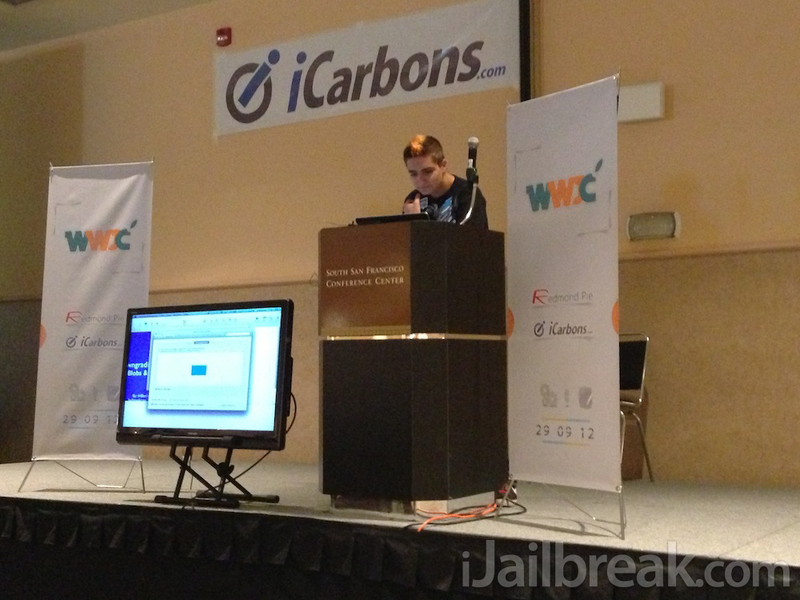 Believe it or not this is not the first time the world has been blessed with a Jailbreaking convention. Last year on September 17th MyGreatFest was organized by none other than Craig Fox and took place in London, England. This was the very first time any sort of organized convention was planned out and followed through with to a degree of success. 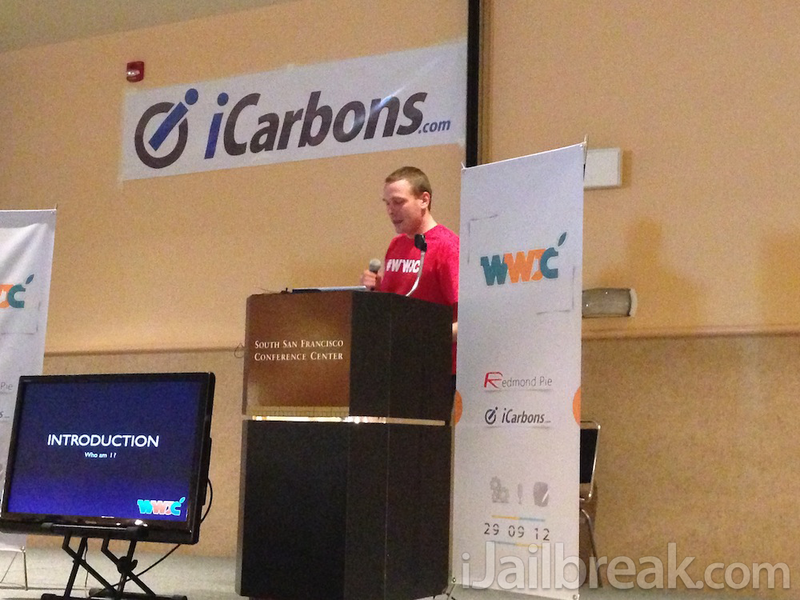 JailbreakCon Is A Convention dedicated to bringing together the thriving Jailbreaking Community under one roof for various presentations and workshops. 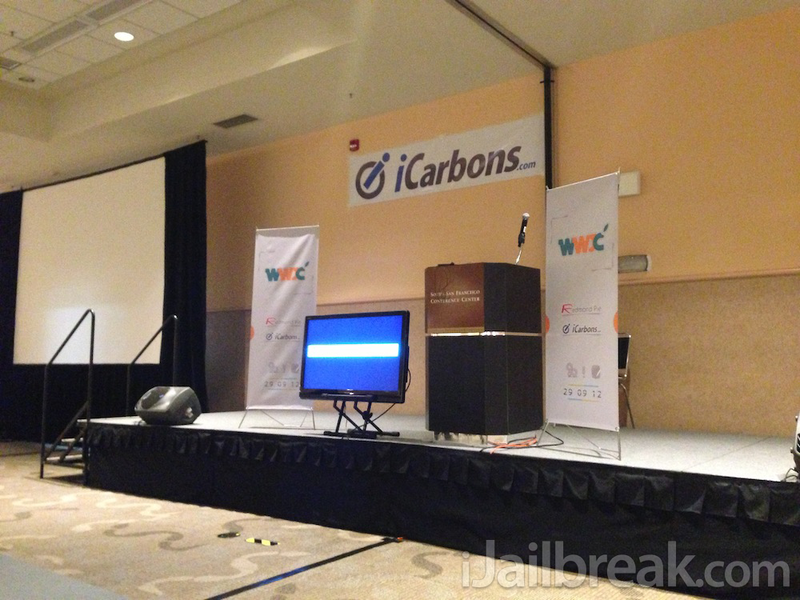 Carrying on the success of last year’s convention, Fox decided to bring MyGreatFest to The United States re-branded under – the better suited name – The World Wide Jailbreaking Convention (WWJC). This would allow him to attract more of an audience than possible in Europe, and at the same time make it easier for most members of the community to attend. He scheduled the event to take place on September 29th, at the South San Francisco Convention Center. The iJailbreak team arrived at the location of the event at around 8am PST and were immediately pleased to see how well the venue came together. Fox and his team were hastily getting everything prepared, the speakers were all doing last minute adjustments to their presentations and there was a really good vibe in the room. We took our seats shortly after arriving and waited for the event to begin. First up on the panel of mastermind speakers was Aaron Ash. 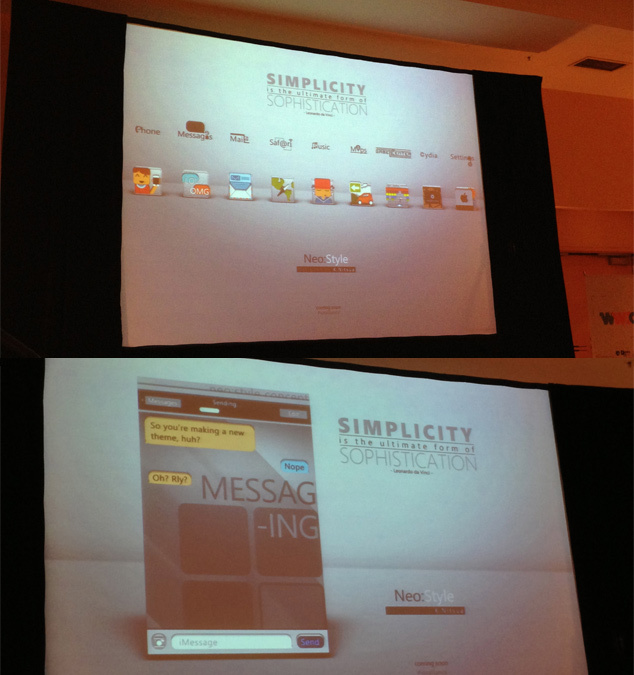 His presentation focussed mostly on the development of his Twitter client Flurry (available in the App Store). Touching on some of the struggles of developing Flurry, and furthermore talking about how Twitter’s new API restrictions have really limited some of the great ideas he originally had for it. One of the most interesting parts of his presentation however, was focused around both the Pros and Cons of the App Store versus the Cydia Store. What do you get when you mix a home-school education with an unbelievably charismatic personality? Well, you get Joshua Tucker – an interaction and interface designer for iOS. Tucker’s presentation was probably the most entertaining presentation of the day, and during his presentation he went on to introducing three new Cydia tweaks he had been working on throughout the last few months – SCALE, MERGE and EMBLEM. If you are familiar with Tucker then you will without a doubt be whipping out your Jailbroken iPhone, iPod Touch or iPad right now to check these Cydia tweaks out. 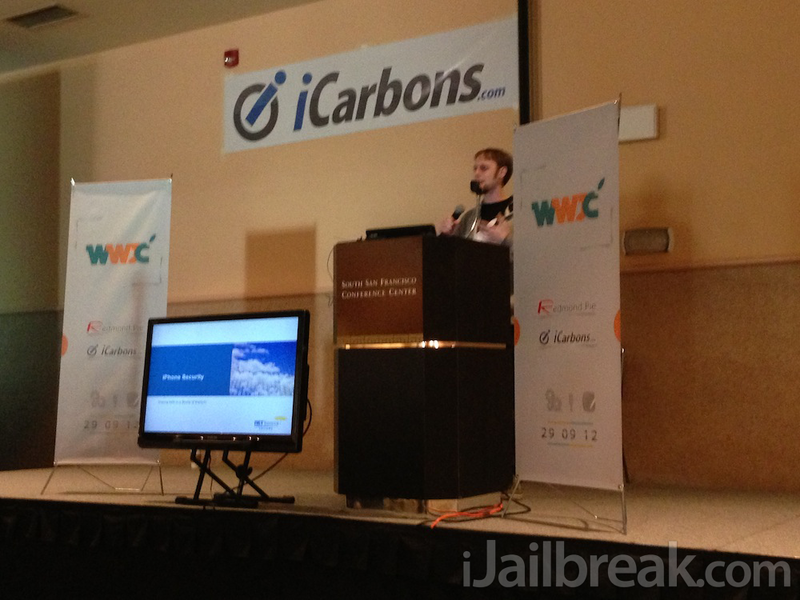 Carsten Heinelt took the stage next to discuss his root iOS file manager called iFile. According to Heinelt, iFile has seen over 20 million downloads over all releases, 1.17 million downloads of the latest version and over 180,000 actual licenses have been sold through the Cydia Store. After touching on the obvious reasons of why iFile couldn’t be accepted into the actual App Store he went onto discussing the future of iFile which includes functionality like Toshiba FlashAir Remote Access, an update to the Dropbox SDK, a WebDAV client, Hex editor and a Landscape Audio player. Probably one of the most anticipated speakers of the day, besides Jay Freeman, came on stage next – Cyril, or otherwise known as Pod2G. 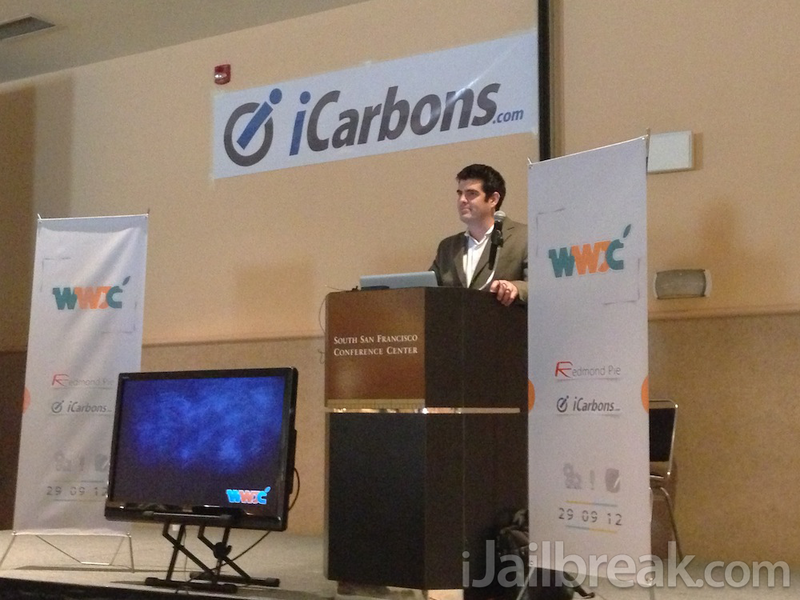 This individual was behind the development of many Jailbreaking solutions such as GreenPois0n and Absinthe. As such his presentation was very technical and touched on the technicalities of Jailbreaking an iPhone, iPod Touch or iPad. Rather than diving into the details of bypassing ASLR or uploading ROP payloads (something way above my head), Cyril did have some good points that he made during his presentation that relate more to the Jailbreaking community as a whole. 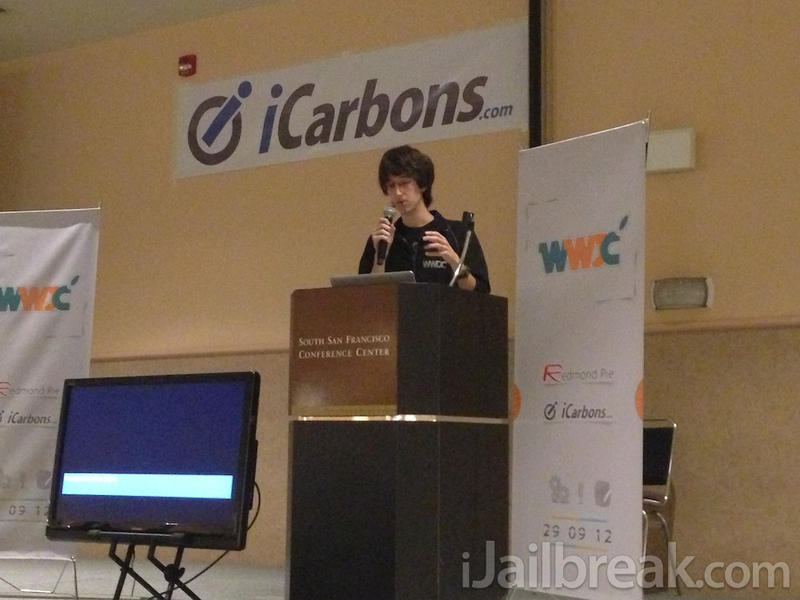 The 17 year old hacker from Toronto, Canada was up next – Steven De Franco or as many of you know him as, iH8Sn0w. De Franco’s presentation focussed around SHSH Blobs and APTickets, more specifically their use in downgrading iOS firmwares. The ultimate conclusion of his presentation was that due to Apple’s transition from SHSH Blobs to APTickets, downgrading will becoming increasingly more difficult, if not impossible. After talking solely about the iPhone, iPod Touch and iPad it was time to transition to the Apple TV. Kevin Bradley aka NitoTV talked about the history of hacking AppleTV, starting with the original AppleTV introduced even before the iPhone. Hacking the original AppleTV was a combined initiative from numerous hackers, and the work done on hacking the original AppleTV paved the way for Jailbreaking the Apple TV 2; introduced approximately three years later. How about the 1080p Apple TV 3? Well, unfortunately not much information was shared about the current status of the Apple TV 3 Jailbreak, but NitoTV did state “there has been some progress made (an injection vector), but it is under wraps right now.” No official progress or ETA was shared. 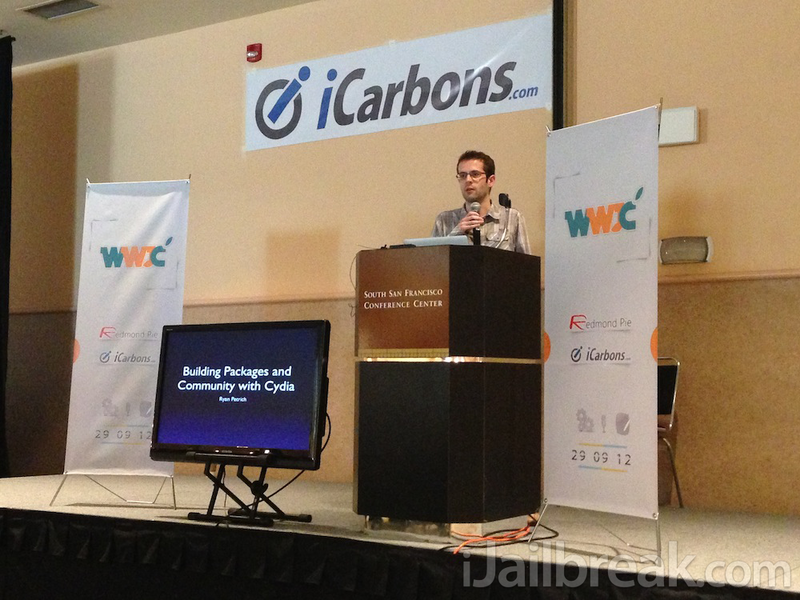 Ryan Petrich, the father behind a countless number of Cydia tweaks, came up next and his presentation was mostly concentrated around how one could go about getting into tweak development. He shared a lot of useful resources to those just getting started, and also talked about all the open source Cydia projects there currently are thanks to his ‘Tweak Week’ initiative. Petrich’s goal from his presentation was to recruit new Cydia tweak developers to the community to hopefully stir up some new creativity. 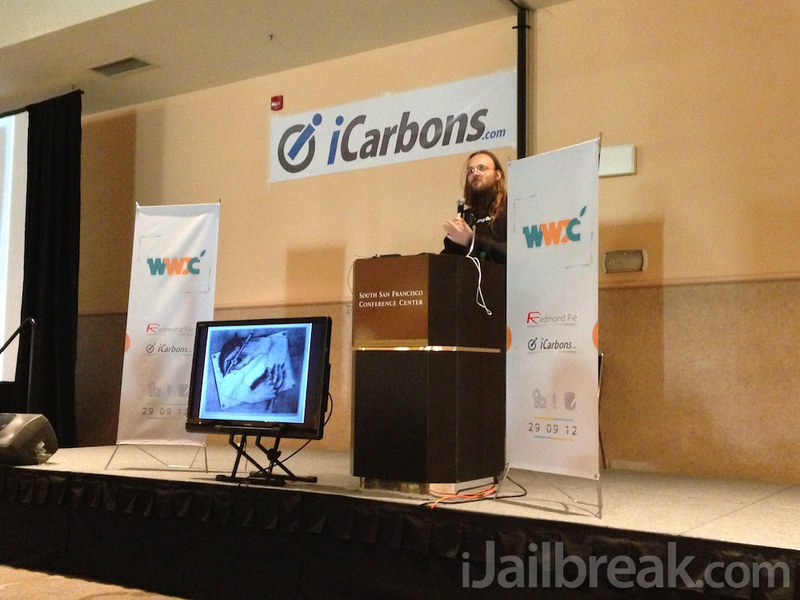 If you are in the mobile security sector then you will be thrilled to know Jay Walker was present at JailbreakCon and he talked about further securing iOS. His presentation was mostly speaking to the corporate sector, but he also gave some simple tips on securing Jailbroken iOS devices with Cydia tweaks like FirewalliP and Protect My Privacy. The two projects he is currently working on to make iOS more secure however, is SIPS and Truecrypt for iOS. SIPS doesn’t rely on Cydia to function and is for the enterprise sector. Essentially what SIPS does is make your device more secure as it watches fro malicious traffic. Walker mentioned that “it was able to detect the Absinthe Jailbreak and defend itself within 2 seconds by shutting itself off.” Truecrypt for iOS on the other hand is a secure solution for everyday users who want to encrypt their entire device, and it will be released within the next couple of weeks. 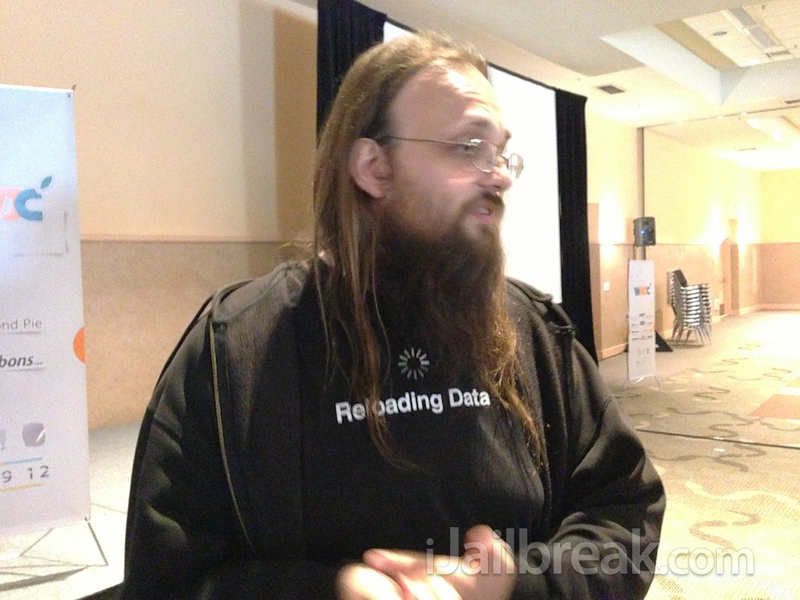 Everyone knew that for Jay Freeman’s (Saurik) presentation, he could take one of two directions – either do a similar style of speech like last years or go a totally different direction. His choice? Go a totally different direction… in fact a large majority of his presentation didn’t even really have to do with Jailbreaking or Cydia. Freeman started his speech in a fairly humorous way, talking about the different formats he has used to do presentations in the past. This ranged from obvious PowerPoint or Keynote formats to actually just having a bunch of tabs open in Chrome and flipping through them. For JailbreakCon Freeman tired something different however, he ran his presentation using an iPhoto album. He began by going through some 10-Q’s of companies like Apple, Google and AT&T. Shedding some light on the widely believed fact that Apple likes to rip developers off; proving this fact wrong of course. This lead up to talking about AT&T and explaining why a cellular provider’s pricing seems so random and unexplainable, while in reality once you actually do some research you realize cellular providers are about on the least profitable kind of company there is. 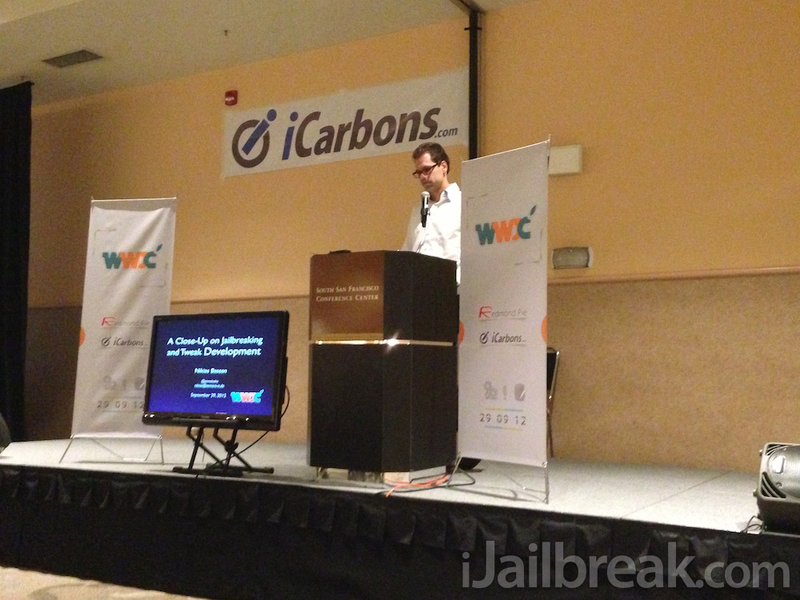 Freeman couldn’t completely leave Jailbreaking out of the mix however, and touched on some Cydia statistics, as well as giving his thoughts on piracy. We actually did an in-depth overview of the information he shared relating to Jailbreaking yesterday that you can check out by clicking here. Theos is like a corvette with saurik sitting in the passenger seat saying we got this!! The developer of Theos came on the stage next, which for those of you who don’t know is Dustin Howett. Theos is essentially “like a corvette with saurik sitting in the passenger seat saying we got this.” No really, those are Howett’s own words. In all seriousness though Theos is an alternative cross-platform suite of development tools for managing, developing and deploying iOS software without the use of Xcode. Most notably it includes a bunch of shortcuts like a project templating system, Logos and .deb packaging capabilities to make developing tweaks or applications for Jailbroken iOS Devices much simpler than ever before. During Howett’s talk he went over Theos and essentially explained how it is useful to the community and why you should use it. With both Howett and Ryan Petrich covering Cydia tweak development, it helped clear up a lot of confusion on where to begin developing Jailbroken software. Things once again took a turn to the more technical side when Pimskeks came on stage. He focused heavily on some of the technical aspects of Jailbreaking like Cyril, and also went into detail about exactly how a Cydia tweak is coded. If anything after this presentation one came away with the feeling of just how hard creating something seemingly simple can be! Bradley also gave us a sneak peak of one of his latest themes that he is working called called ‘Simplicity.’ This theme features 3D-esque icons that are from the perspective of looking above them, and it really is an impressive theme to say the least. Once the Simplicity theme is released it will be a complete iOS UI overhaul. 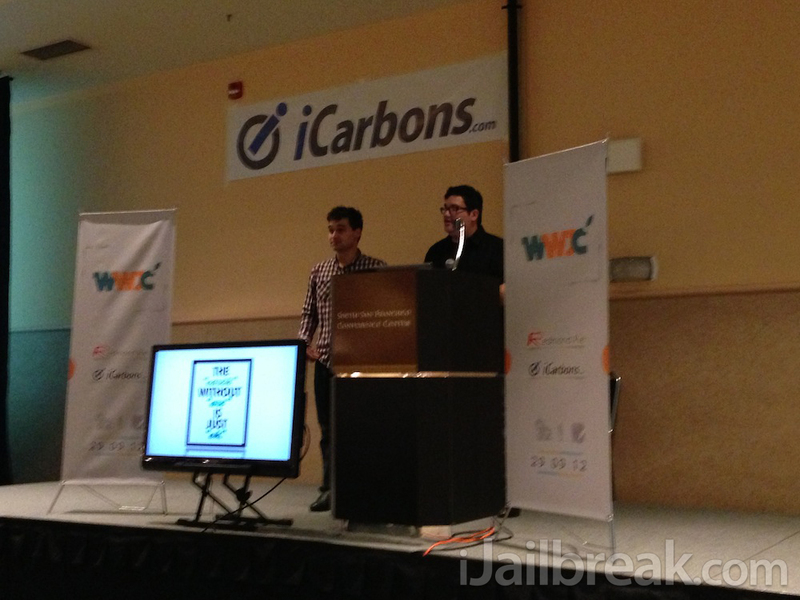 That concludes JailbreakCon 2012! Thanks to all the hard work of Craig Fox and his team, nearly the entire Jailbreaking community was able to get together in one room and it was phenomenal to say the least. Everyone who attended the event walked away with a smile on their face and it was definitely a success to say the least. Fox has already stated that there is going to be another convention next year in New York, and iJailbreak will without a doubt be in attendance/sponsor the event. A shootout also goes to iCarbons for sponsoring the event and hooking us up with some giveaway merchandise that we will do soon. 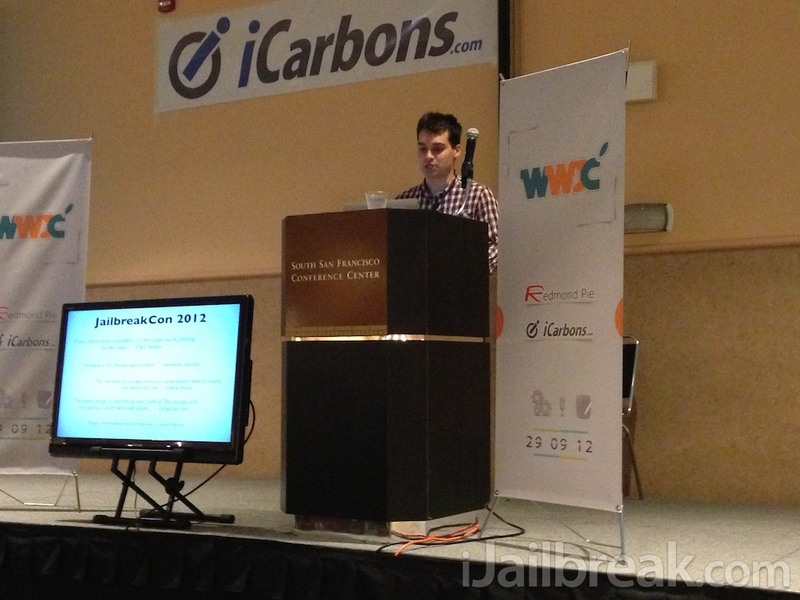 when will the jailbreak [untethered] for ios-6 be released?